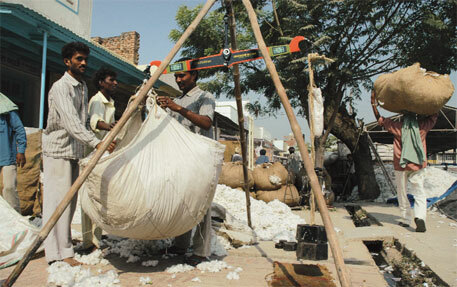 THE area under cotton cultivation in the country is likely to shrink this year despite bumper production in 2011-12. Reason: delayed monsoons, high cost of cultivation, low market prices and inconsistent export policy. Farmers are shifting to other crops like guar, groundnut, soya and pulses. The shift is happening in major cotton producing states, including Gujarat, Haryana, Maharashtra and Punjab. Although the agriculture department of various states say it is too early to predict the exact state-wise decrease in area under cotton, they do confirm it would vary between five and 12 per cent. B R Shah says about 100,000 to 200,000 hectares (ha) of diversion from cotton to groundnut is expected in the state. Last year 2.7 million ha was under cotton in Gujarat. “Farmers in the state have got a good price for groundnut and want to grow it. We are also promoting it,” says Shah. Since 2011-12 saw bumper production of cotton its price was Rs 2,300-Rs 3,000 per quintal (100 kg), while groundnut prices were over Rs 3,000 per quintal. An official from the Haryana agriculture department, on the condition of anonymity, says the state has witnessed about 20 per cent decline in the area under cotton. “Last year in May cotton was sown in 450,000 million ha. This year it is around 350,000 million ha,” he says, adding that farmers are trying to experiment with guar and pulses. Guar, a bean mainly grown in Rajasthan, has found a good market because of its use as a lubricant in gas drilling. It sells at Rs 20,000 per quintal. No report of decrease in acreage in Andhra Pradesh, the largest cotton producing state, has been reported yet. The state, which saw 4.7 million ha under cotton last year, goes for late sowing of the crop. An official from the agriculture department says farmers in the state start sowing in June-July after the arrival of monsoons. “It is too early to predict the trend because farmers still want cotton. Recently, a stampede like situation arose in Ranga Reddy district where cotton seed was being sold,” he said.